"You are unique! Everything around you is imperceptibly changing but you notice more than others and your finger confidently taps the anomalies. 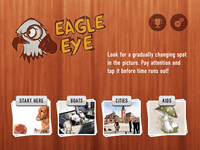 Check if you manage to attain the "Eagle Eye" title. Fascinating dynamic gameplay made easily comprehensible with the assistance of training levels. Help and tips for passing complicated levels. Unique colorful pictures which look wonderful on iPad and Retina displays. 4 thematic pic collections which include an exclusive pack for kids (which is very exciting for adults as well). Awards for extraordinary achievements in the game. The option to share your results in Facebook and Twitter."